Edward VII was the eldest son of English Queen Victoria and her German husband, Prince Albert. The royal couple had high standard of morality that set the tone for the whole nation, shaping their society and the way we still perceive it now. Although they tried their best to instill their values into their son and heir, Bertie turned out to be more like her mother’s uncle, King George IV: a womanizer and profligate who loved to have a good time. Clarke argues that his taste for all the good things in life is typically French. It was the French people, more than his parents, that shaped Bertie’s character and the man he became. It was during his first trip to France, at the young of 13, that Bertie met his “mentor”, the profligate emperor Napoleon III. A sort of father figure, much less strict than his real dad, Napoleon showed Bertie that a crown comes indeed with duties and responsibilities, but also with lots of perks he should enjoy to the full. And that’s exactly what he did. Throughout the course of his life Bertie would find an excuse or another to go, pretty much every year, to Paris or the French coast, where he was both loved, for his lack of airs and graces and his genuine love of people, by both the richer and poorer classes. He had many French mistresses and friends, attended the opera and theatres and just enjoyed all the best France had to offer. But France didn’t just teach Bertie to be frivolous. On the contrary, visiting the neighbourhoods inhabited by poor people made him aware of the miserable conditions in which these people lived, prompting him to try to help the English working classes. France also made him a skilled diplomat who helped bring about the Entente Cordiale between two countries that had been enemies for centuries. Clarke also argues that, had Bertie lived longer, World War I may have been averted. The English King loved peace, and the many benefits it afforded everyone, too much to let war break it. Clark writes in a witty and engaging way that makes the book a pleasure to read. Rather than reading an history book, I felt like I was gossiping about Bertie with a friend at the pub. Because of this, the book will appeal even to casual readers who want to know more about this underrated English King. Just don’t expect a full biography. The book barely discusses Bertie’s family or his life back home. It is simply a fascinating study of Bertie’s visits and holidays to France and the way that country shaped him, and how that, in turn, affected Bertie’s behaviour, policies, and time. Highly recommended. Il Signore Del Falco (The Master Of The Hawk) is the second historical novel by Montaldi that features Father Matthew, an English monk who, after being kicked out of his monastery, roams the continent. This time Matthew is called to investigate the murder of a woman, who had given birth just before her death, killed 17 years ago. The story takes place in a medieval Milan, where its inhabitants are fighting the eretics and trying to keep their independence from the Holy Roman Emperor Frederick II. The book has pretty much the same pros and cons as Montaldi’s first work, Il Mercante Di Lana (The Wool’s Merchant). It is clear that Montaldi loves this historical period and has done her research really well. The historical details are accurate, and the medieval world Matthew inhabits, with its customs, people, buildings, hypocrisies, prejudices, and fights, really comes to life. But rather than being vowen seamlessly into the story, all these details often bog it down. The book reads like an essay and novel all rolled into one. The essay bits are very interesting, but just slow down the story without adding much to it. The other problem is the language. All the characters, whether rich or poor, educated or illiterate, speak in the same voice. There is barely any dialogue for pages and then, one of the characters will start speaking, uttering a very long monologue full of difficult words. This just isn’t believable. Very few people, if any, talk like that, and none certainly belong to the poorer classes. We all have an inner critic. But for a lot of us, this critic is so harsh that, rather than help us stay out of trouble and achieve our goals and dreams, gets in the way of them, destroying our confidence and preventing us from living the life we truly want and deserve. This negative self-talk affects the way we act and the choices we make. Therefore, to change our behaviour, we first need to change the way we think. 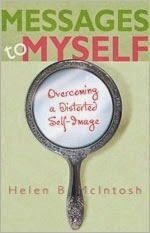 In this book, Christian counsellor Helen B. McIntosh gives us the tools we need to restore a positive self-image. McIntosh’s approach is biblical-based, but, as the sceptical among you may be pleased to know, her findings and ideas are supported by secular psychology too. This stuff works. One of the most powerful tools in the book is the Truth Chart, where readers are encouraged to register both their own negative thoughts about themselves and what God believes of them instead. This helps readers see themselves through God’s eyes and perspective, substituting the lies you believe about yourself with His truth. The book is written in a simple, engaging, and encouraging tone. McIntosh shares her personal stories and countless examples from real life to show readers how well her tips works. But she never preaches. You won’t find boring lectures here, but just a friendly voice that will help you overcome your negative self-talk. At the end of every chapter, McIntosh also provides a prayer for added guidance, and some exercises that will help you put in practice what you’ve just learned. If you’re a Christian struggling with negative self-talk and self-esteem issues, I highly recommend you pick up a copy. It may change your life. Do any of these books appeal to you? Disclaimer: I received Dirty Bertie and Messages To Myself in exchange for my honest opinion. In addition, this post contains affiliate links.